13 June 2018, at 12:00a.m. The launch of “Your Harvest” at the Cereals event today saw the release of a guide for farmers, outlining the importance of the sector, with suggestions of how to share that with parliamentarians throughout Harvest 2018 and beyond. NFU Crops Board Chairman Tom Bradshaw has championed the initiative and said: “The UK arable sector has a brilliant story to tell. And never has there been a more important time to tell it. “There’s no question that the arable sector will face its fair share of change as the UK leaves the EU, particularly around farming’s relationship with the natural environment. 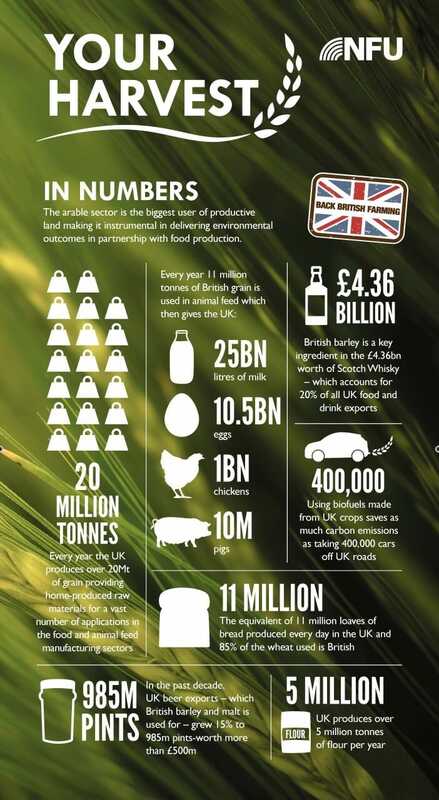 This campaign presents an opportunity for farmers to be on the front-foot; to proactively talk about the millions of tonnes of grain we produce, how we produce it and what that contributes to the UK. As custodians of swathes of our iconic British countryside, arable farmers have embraced the environment – through the widespread adoption of integrated approaches to controlling pests and diseases and the planting of hedgerows and hundreds of acres of wildflowers mixes. “The #YourHarvest campaigning guides that we’re handing out today will help give farmers the tools to enable them to increase the understanding of our sector amongst decision makers.